This novella-length book of short stories is outstanding. 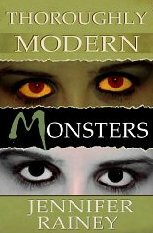 I suppose Thoroughly Modern Monsters has to be categorized as urban fantasy. Its seven stories are set in an alternate U.S. in which everyone seems to know about “monsters” (gorgons, vampires, werewolves, and so forth) and the “Monster Relocation and Employment Act” has been passed to control their more dangerous tendencies and to make use of their special abilities. Forgoing the gritty style typical to the subgenre, Rainey’s first-person and third-person-limited narrators sound like characters from literary, rather than genre, fiction. The narratives are allusive and subtle, with much left unstated (though clear enough to the careful reader). Pat morals are nowhere apparent. The stories’ central concerns, too, transcend the genre: although the set-up I’ve described above could easily generate a typical dystopic urban-fantasy plot, Rainey is far more interested in subtly drawn human relationships and character development. Most of the stories focus on one or two central characters who are struggling with the dislocations imposed by the MREA or with the challenges of being monsters integrated into human society. Half-siren Quinnish works as a barker for a carnival that never goes near the sea. Todd and his wife, Marsha, struggle to adapt after he’s downsized out of the job he was born to — grim reaper. A couple of the shorter stories might’ve benefited from just a bit more development. “The Monster Relocation and Employment Act,” the collection’s last story, is an example. At only about five pages on my laptop screen, it’s really short. A few more pages might allow the poisonous conventionality of Lizzie and Frank’s mindset to emerge in a more rounded way. But this is minor critique. What’s there is already very good. Rainey’s prose is great: clean and error-free (literally — I saw one typo and no mechanical errors). She writes natural-sounding dialogue and concise paragraphs, with no flab. The ebook is perfectly formatted, with the strange exception that (at least in my case), the table of contents appears at the end of the book, not the beginning. The cover is decent, though something more enticing could probably be created with the help of a professional designer. I highly recommend this book. I hope that its genre-blending tone and interests don’t doom it to a small readership. It’s a real find — indie authorship at its best.